I don't like to cook jams in big batches unless for gifts, of course. For just the two of us I like to cook a small amount so it stays fresh and doesn't need to sit in the fridge for a long time. This is also a great gift idea, .a jar of jam with fresh biscuits or a loaf of bread, it should bring smiles to pretty much everyone. 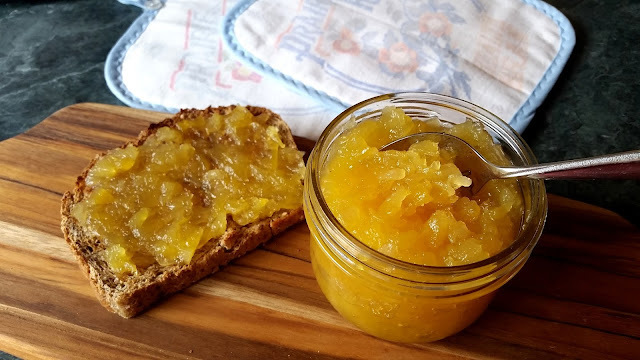 This recipe for pineapple jam has only 2 ingredients, that is as simple as it gets. It is delicious on biscuits or toast and I'm sure it would be tasty as a topping for pancakes or cake. In a medium sized cooking pot over medium high heat, bring pineapple with juice and sugar to a boil. Turn heat down to medium, cook and stir for 7 minutes until jam thickens. Pour into a jar, screw on lid, and allow to cool. Yield: 1 1/4 cups jam. I have not used canned fruit other than pineapple. I have used fresh rhubarb, I just cut up the rhubarb, add sugar and cook until it starts to thicken. I don't see why it would not work with any fresh fruit. do you add any liquid to the rhubarb? I have cooked it without adding water. Sometimes I add a wee bit water, maybe a tablespoon or two. Looks so delicious! I think I have never tasted pineapple jam, maybe should try! Wow - that's so simple and sounds absolutely delish! I think this would also be a great ice-cream topper? Great idea Rosella. Maybe for a banana split? This is a great recipe! I love that it makes such a small amount as I have a small family. How long do you think it would keep opened up and in the fridge? Would it last as long as a store-bought jam? Love this, Betty ! perfect ! !